This album a double cd of over 20 tracks would have killed at 12 tracks. Having said that this cd has a ton of radio ready blues rock that begs for airplay. I still prefer Guy’s Skin Deep (2008) Living Proof (2010) and Sweet Tea (2001) for complete albums. Yet, Buddy Guy has always been a been a unique artist who is known for his impulsive stage and guitar dynamics. A foray into this many tracks should not come as a surprise. On this album and others producer/songwriter/drummer Tom Hambridge for my money is easily one of today’s gifted producers for contemporary blues. His sound and vision for his artists comes from a players perspective and this works wonders on the superb groove of Best In Town, the slinky I Go By Feel, the excellent All That Makes Me Happy Is The Blues and the gutsy What You Gonna Do About Me with a sizzling co-lead vocal from Beth Hart. All these tracks feature the whomp and groove of the mighty Muscle Shoals Horns. If that was not enough, the stereo mix on this entire album is a total delight. 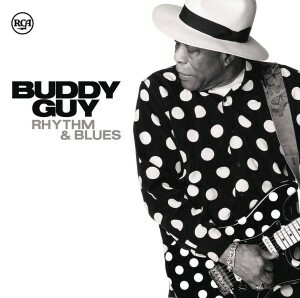 For younger listeners Buddy Guy’s modern day blues icon status began with Damn Right I’ve Got The Blues his 1991 smash which included the hit title track, a killer remake of Mustang Sally and guests Eric Clapton Jeff Beck and Mark Knopfler. Stevie Ray Vaughan who died in 1990 had vaulted the blues/blues/ rock to multi-platinum status and the Jeff Healey Band had international success. Other notable tracks on Rhythm & Blues are the straight ahead 12 bar number Blues Don’t Care with Gary Clark Jr and the ripping Too Damn Bad.